Planting Dates: For spring, plant seed 3-6 weeks before the average last frost. For fall, plant 6-8 weeks before the first average frost. In general, February 20 - March 31 and August 10 - October 31. Planting Method: Plant seeds in rows or by broadcasting on top of the soil and 1 inch apart. Tamp the seed into the soil after sowing. 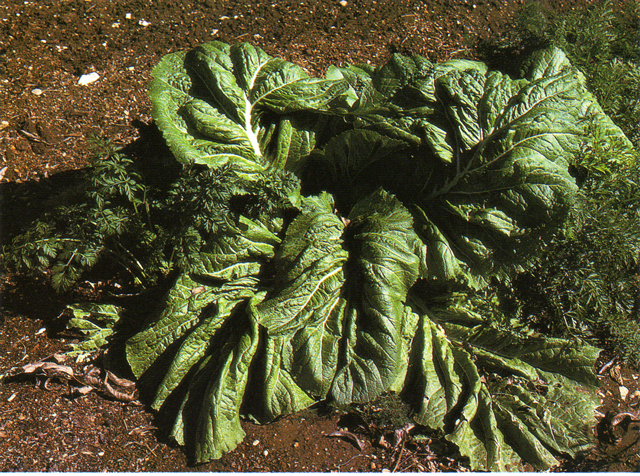 Growth Habits: Leafy vegetable that can be cooked or eaten raw. Mustard likes cool weather. It is cold hardy down to about 20°. Can usually be grown all winter in most of Texas. Small yellow flowers are edible. Culture: Easy to grow in any healthy soil. Mustard likes lots of organic matter. Mix plenty of compost into the soil before planting as well as lava sand and soft rock phosphate. Fertilize at least once during the season with an organic fertilizer. Spray foliage at least biweekly with Garrett Juice. Mustard greens like raised rows to increase the drainage. Mulch between rows. Troubles and Solutions: Aphids are controlled by planting at the right time in healthy soil. Spray molasses and water, and then release lady beetles for occasional infestations. Downy mildew and white rust can be controlled with Garrett Juice plus potassium bicarbonate and/or garlic. Garlic/pepper tea helps control all the above pests. Use Bt sprays for cabbage loopers. Harlequin bugs attack when the plants go into stress because of hot weather. Harvest and Storage: Harvest by the cut-and-come again technique or by removing the entire plant and planting additional seed. Greens are usable at any size. Young leaves are best for salads and fresh eating. Older leaves should be cooked. Harvest the seed when the pods turn brown. Young seed pods are also edible. Flavor is better after the first frost. Can be stored at 32-40° for 1-3 weeks. Notes: B. hirta is white mustard, B. nigra is black mustard. Their seeds are used to make table mustard. B. juncea is brown mustard. Black mustard seed is the hottest. Varieties: Green Wave, Osaka Purple, Red Giant, Tendergreen II, Florida Broad Leaf, Southern Giant Curled, and Mizuma. Tendergreen. Q: We have a beautiful mustard green crop that has survived the freezes of this winter. When harvesting the leaves and stems I noticed about 1/3 of the leaves have holes eaten in them, particularly the newly forming, more tender leaves. There are numerous lady bugs present, especially down in the base of plants where eaten new leaves are forming. A few aphids are on leaves with lady bugs in pursuit. Any suggestions? K.M., Irving. A: The holes may be caused by small caterpillars. If so, they can be controlled with trichogramma wasps or Bt (Bacillus thuringiensis) spray. If the pests are beetles of some kind, spray the plant oil products or the mixture we use for fire ant mound drench which is made of equal amounts of orange oil, compost tea and molasses. Mix 4 oz of this concentrate into a gallon of water. Garlic tea sprays will also help control these pests as well as help with diseases.